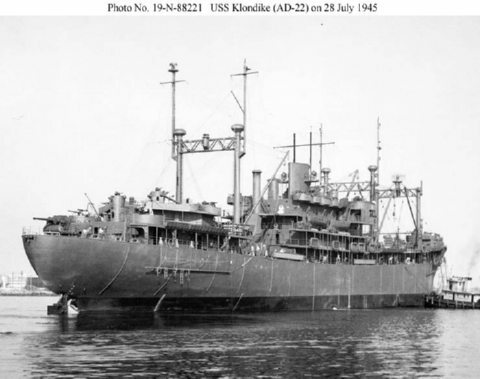 Klondike (AD-22) was launched 12 August 1944 by Todd Shipbuilding Corp., San Pedro, Calif.; sponsored by Mrs. Dorothy J. Diirck; and commissioned at San Pedro 30 July 1945, Comdr. M. B. Hatch in command. After shakedown, Klondike loaded hundreds of tons of spares and stores in preparation for the important task of supplying and maintaining the speedy, hardhitting destroyers. Designed as a "mother ship" for the "greyhounds of the fleet," she departed San Pedro 19 October for Pearl Harbor, arriving the 25th. Recalled to the West Coast, she sailed from Pearl 7 November with 500 home-bound veterans embarked and arrived San Diego 15 November. On 21 November she became the flagship for Commander, San Diego Group, 19th Fleet; and commenced inactiviation operations on ships scheduled for the Pacific Reserve Fleet. Placed on an inactive status (in commission, in reserve) 30 November 1946, Klondike was placed in service in late summer, 1948. She served as flagship until 11 May 1955. Klondike recommissioned 15 July 1959 at Long Beach, Comdr. F. F. Mullins, Jr., in command. Returning to San Diego 4 December, she provided repair facilities as a unit of SerRon 1. On 20 February 1960 she was re-classified as repair ship AR-22 and she repaired vessels at San Diego, Long Beach, and San Francisco until 15 July 1961. Klondike then departed San Diego for duty in the Far East. Assigned to SerRon 3, she arrived Yokosuka, Japan 4 August; and until 23 February 1962 she provided repair facilities at Sasebo and Iwakuni, Japan, and Subic Bay, P.I., for the peace-keeping ships of the mighty 7th Fleet. Returning to the West Coast 11 March, she resumed her duty out of San Diego. Departing San Diego 17 July 1963, Klondike steamed via Pearl Harbor for the Western Pacific. While en route to Sasebo, she offered assistance 6 through 9 August to distressed Greek freighter Cryssism during a raging typhoon. Reaching Sasebo 11 August, she proceeded to Subic Bay 15 August for repair ship station duty. Klondike operated in the Far East until 30 November; then she returned to the United States, arriving San Diego 14 December. During the next year she continued servicing ships while operating out of San Diego and San Francisco. Klondike continued to repair the ships of the Pacific Fleet into mid-1967. Her last Far Eastern deployment began 25 February 1966 when she departed San Diego. She remained in the Orient repairing the ships of the mighty 7th Fleet until returning to Pearl Harbor 27 October. The remainder of the year was devoted to preparing for future action in 1967.